I am a really weird twin mom. I copiously read twin books during my pregnancy. I learned what I was supposed to do. I talked to many twin moms. I heard them. I put lots of post-it notes in my brain. Somehow, however, I have gone rogue. -NO TANDEM FEEDING! I hated it. I won’t go into the details here, but that was a no-go. Plus, one twin had feeding problems anyway. -Did not get them on a schedule. Um, the books never talked about what to do if you have an extremely particular and high-maintenance 2-year-old to deal with first. Also, the books kind of glossed over the fact that fraternal twins are very different people. They have different sleeping needs, different feeding methods, and different personalities. They both go to bed at the same time, so that’s all that matters. I have a little secret, and that is that I kind of *like* dealing with one twin at a time. (*Note: I finally got them on the same schedule by 7 months, when they were ready and I was ready. It involved stopping breastfeeding, starting crying-it-out and donning separate rooms). -Not dress them alike because they are each a beautiful or unique snowflake. -Took two trips up the stairs each time. I cannot, for the life of me, carry both babies at the same time. I originally assumed it was because of my lack of upper body strength. I have since decided it is from my lack of upper body. Period. Seriously, bosomy grandmas can do it. Husband with large pecs and shoulders can do it. I have a BMI of 19 and I cannot do it. On the plus side, I get a hella workout taking two trips up and down the two flights of stairs we have in this large house. … many times per day. 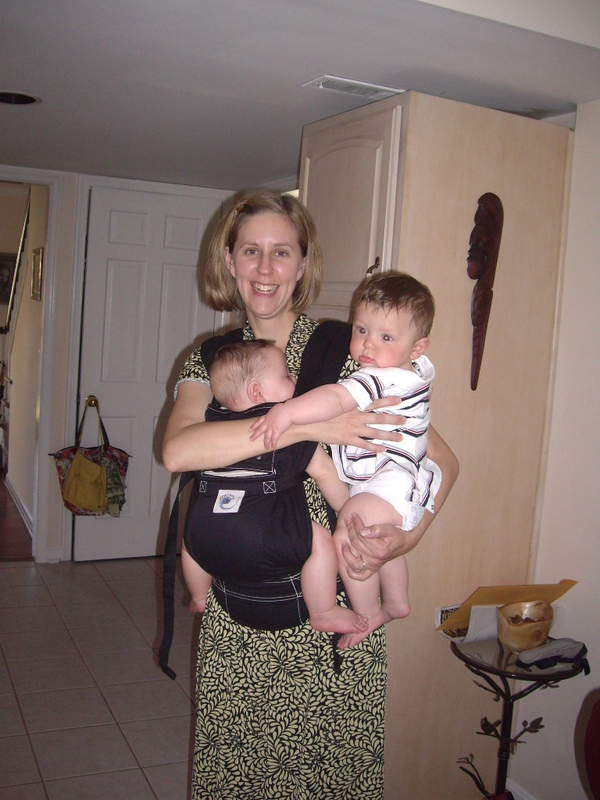 This is probably the only picture of me carrying both of them. True. And thanks! I would love to read a Twin Survival Guide written by you. Can you get on that, please? My fraternal twin daughters are 4.5 and I agree – they are amazingly different people! I loved the picture of you holding them together at the bottom of this page. When we finally made it home after the NICU I stayed home except for doctor’s appointments because we were in the height of RSV season. I used to get so stircrazy that I’d put one in the sling and the other in my hip and we’d walk around my tiny yard and I’d talk to them about flowers. Whew those days flew by. Now my girls are one short year away from Kindergarten and all I think about is finding a way to quit my job so that I can keep them with me for the little bit of time I have left before the Kindergarten/School Treadmill starts. They attend Pre-K for 3 hours a day, but the other 5 they could be with me instead of in a daycare classroom/playground. I miss my girls. From a grown up twin with with 3 kids of my own – we survive! We were so different (so my big sisters tell me) he wore pink, I wore blue. He stayed home, I moved away. Your little ones will be just fine, it just goes so quickly,cherish the moments. Thank you for being caring mums! I absolutely adore this. I am so thankful that I am only pregnant with one baby and not two. Everyone had their own ways of doing things, and I think you’re doing just fine!